The Annual Hillman Marsh Shorebird Celebration, featuring migrating birds and Ontario Field Ornithologists (OFO) helping to identify them, takes place at the Hillman Marsh Conservation Area on May 1-19, 2019. Witnessing migration activity at the Shorebird Celebration in May is one of the highlights of this area. The diverse habitats of Hillman Marsh attract and support marsh, shore and field birds such as herons, egrets, terns, songbirds and ducks as well as a nesting pair of Bald Eagles. Over one hundred species of birds use Hillman as a migration stopover which draws sandpipers, ducks, warblers and frequently spotted annual rarities such as the Yellow-headed Blackbird, Willet, Marbled Godwit, Eurasian Wigeon, Glossy Ibis and Eastern Kingbird. The shorebird habitat at Hillman Marsh is unique in North America. The managed habitat creates the perfect combination of mudflats to provide nutrition and a resting area for migrating shorebirds, offering outstanding viewing opportunities. Experts from Ontario Field Ornithologists (OFO) will be at the Shorebird Viewing Shelter from 3pm – 5pm, six days per week, to help guests identify these stunning creatures. OFO will not be on site on Mondays. There are also bird identification signs at the shelter highlighting distinguishing characteristics. Hillman Marsh Conservation Area is located just minutes from Point Pelee National Park. With 5 kilometres of trails around this precious marshland habitat, Hillman Marsh draws wildlife and people from both near and far. 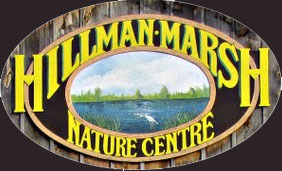 The walking trails, nature centre, washrooms and viewing towers at Hillman Marsh can be accessed from the main entrance. Entry is $6 per vehicle. For more information visit: https://essexregionconservation.ca or call 519-776-5209.